A collated set of sequence and genotype information on cattle breeds in Africa is currently not available. Such a resource is important at is can underpin the design of genomic tools for different applications. 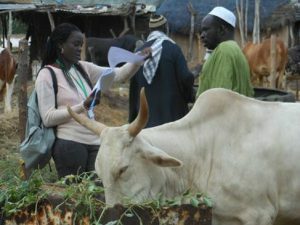 The Dairy Genomics Program of the Centre for Tropical Livestock Genetics and Health (ctlgh.org) proposes to help generate this important resource by collating data already available in public database and (where access is granted) with private research groups, and through the generation of new data obtained in collaboration with African and potentially other partners. The initial target for the resource is 25 African cattle breeds with sequence information on at-least 10 individuals per breed, by the of end-2017. The expectation that the number of breeds, and individuals per breed, will increase over time, as the initiative gains momentum and additional resources become available. The genomic reference resource will be a database – accessible to all stakeholders and which is well documented– of genomic information on African cattle breeds, linked to meta-data, such as GPS location of where the animals were sampled, a, amongst other. Benefit sharing on AnGR use: All data newly generated under this initiative will be generated in collaboration with partners who wish to participate, utilising appropriate access and benefit sharing agreements. The expectation is that all data will be made publicly available.